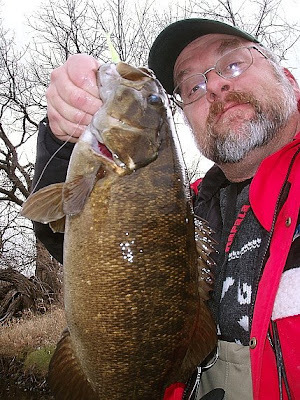 Sunday afternoon Smallmouth action 11-16 - - - 2 messages. Showing 1 through 2. I got out to the Mississippi river for a late fall bassin outing. I was suposed to meet BP Dave Maas, but he couldn't make it so I hit the water by myself. I found a nice looking spot near some trees in the water and started jigging a berkley minnow on a 1 / 16th ounce jig. I got one on the first cast!, then I hooked into a huge one probably over 4 pounds. "fishface" Jim Bonin showed up just in time to take a pic for me. Then he when flyfishing and started getting some smaller bass on surface flies. 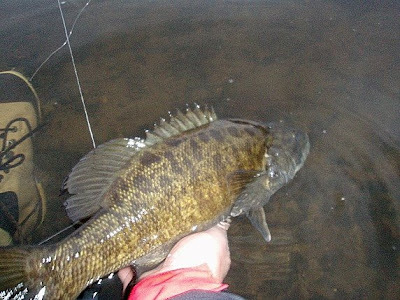 I kept flinging different plastic minnows and probably caught a dozen bass, three of them huge, the rest were "fun sized" it was around 30 degrees and windy, but I stayed plenty warm with my arctic Armor parka even though my waders did leak some! Are you catching better size on live bait or on the flies? I'm assuming the minnows. How about numbers? More on flies?